The basketball world is buzzing and the word everyone’s uttering is Linsanity. This phenomenon has swept across the nation like a wildfire and the reaches have gone global. The name on everyone’s tongue is Jeremy Lin; the team is the New York Knicks; and the theme is an unlikely Cinderella story. But where did this undrafted sophomore player come from? And how did his arrival in New York spark a sputtering Knicks team to a 7 game win streak? There are pretty clear answers to how this has happened. What’s unclear is if Jeremy Lin will be able to keep this magical run alive. Jeremy Lin, age 23, is the NBA’s first American born player from Chinese or Taiwanese descent. He was born in Los Angeles and grew up in nearby Palo Alto, CA. Lin excelled both athletically and scholastically in high school and went on to attend Harvard University in the Ivy League Conference. After playing for Harvard’s basketball program for all four years, Lin graduated in 2010 with a degree in economics and a 3.1 gradepoint average. He became the first player in the history of the Ivy League to record at least 1,450 points (1,483), 450 rebounds (487), 400 assists (406) and 200 steals (225). Despite this accomplishment, Lin, like most Ivy League players, went undrafted in the 2010 NBA Draft. He did, however, receive offers from a few NBA teams and accepted a two-year deal with his hometown team, the Golden State Warriors. After Lin’s 2010 rookie campaign in Golden State, his production, or lack there of, was a byproduct of his minimal playing time. He averaged less than 10 minutes per game coming off the bench in only 29 games. The Warriors waived Lin on the first day of training camp, Dec. 9, 2011, following the conclusion of the NBA lockout. He was picked up off waivers three days later by the Houston Rockets but only spent 12 days on their roster before they released him to clear salary space. On Dec. 27, the Knicks picked up Lin off waivers with the intention of having him as their thirdstring point guard. Feb. 4, 2012, Linsanity began at home, Madison Square Garden, against the New Jersey Nets. The Knicks had lost 11 of their last 13 games and frustrations with their point guards (Toney Douglas and Mike Bibby) were mounting. Jeremy Lin came off the bench to score 25 points and dish 7 assists to help the Knicks to a victory and lead all scorers. On the 6th , Lin got his first NBA start against Utah, the Knicks playing without star Amar’e Stoudemire who left the team due to the death of his brother. The team’s other star, Carmelo Anthony, injured his groin in the first quarter and left the game. Lin stepped into the New York spotlight and scored 28 along with 8 helpers. With Amar’e and Melo still out, he dropped 23 and 10 against Washington two nights later and Linsanity was officially underway. Lin was on the radar when the Lakers came to the Garden on the 10th , but there were still more doubters than believers. Lin responded by dropping 38 points! He also dished seven to lead the team to their fourth straight win. The Knicks were rolling with their newfound hero as they eked out wins at Minnesota, at Toronto, and then dominated Sacramento at home to cap a 7 game win streak. Amar’e had rejoined the Knicks in Toronto and, although he showed a little rust, he played well with Lin. The win streak ended when the Knicks lost to a lowly New Orleans squad, Feb. 17, with Lin scoring 26 but committing a career worst 9 turnovers. Lin and the Knicks rebounded the next game when they played the reigning champs, the Dallas Mavericks. Lin played 45 minutes of 48 and lit up another 28 points, more impressively adding 14 assists to earn another huge win. Star Carmelo Anthony returned to floor Feb. 20 as the Knicks took on the Nets once again. Many had feared Melo’s return would have an adverse effect on Lin’s performance in that he wouldn’t have as many opportunities to score with Anthony demanding more touches. 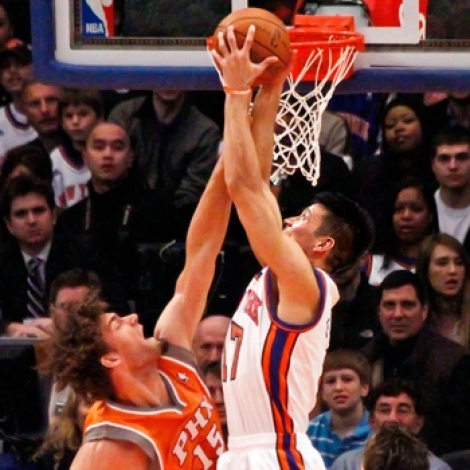 Although the Knicks lost the game, Lin still scored a team high 21 points and dished another 9 assists. The loss, however, confirmed fears that Melo’s slowed down style of play is not conducive to Coach Mike D’Antoni’s basketball philosophy. D’Antoni subscribes to a fast paced, run-and-gun, theory of high scoring basketball to which Lin fits perfectly and had clearly been working with the Knicks winning 8 of 9 games prior to Carmelo’s return. Now it appears the pressure is on Melo to conform to D’Antoni’s system, while fan favorite Lin can just continue to do what he has been doing. The Knicks never planned on Jeremy Lin being a key factor in the outcome of their season. But after 10 games of significant playing time and averaging 24.6 points and 9.2 assists per game, he is no longer merely a backup plan. Looking forward, Lin will be an integral part of the team’s future success. And if the Knicks fail, it won’t be Lin that is blamed. It will be Melo as the scapegoat because if Lin and the Knicks can win without him, they certainly should be able to win with him.